When pediatrician Dr. Robert Hamilton’s video demonstrating how to soothe a crying infant hit the web, it became a YouTube sensation, garnering over 15 million views in ten days. New parents around the world employed Dr. Bob’s now-famous “hold” on their newborns, and embraced him for the warmth, calm, and confidence he radiates in his viral video. Now, that warmth, calm, and confidence comes across on the page, as well. 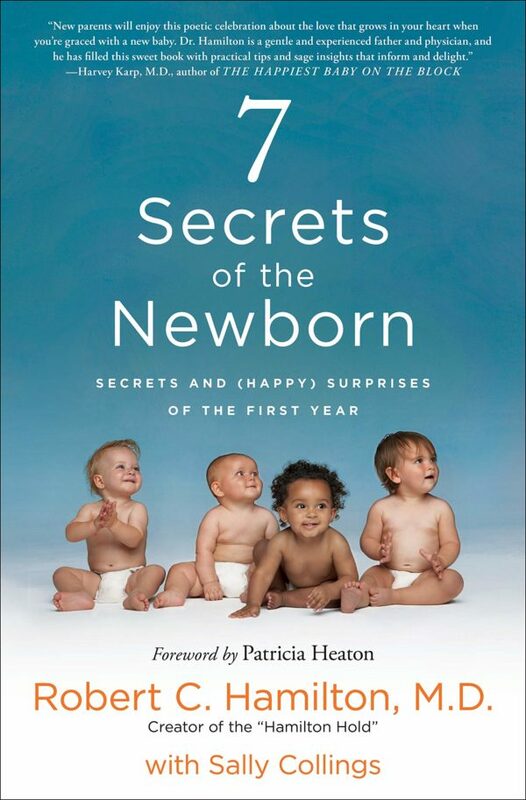 In 7 SECRETS OF THE NEWBORN: Secrets and (Happy) Surprises of the First Year (with Sally Collings), Dr. Bob offers up his top seven tips to make it through the first year of parenthood, and emphasizes that babies are simple, so parents should keep it simple too. Having a baby is going to throw you for a loop, but you’re going to fall desperately in love with your little boy or girl the minute they are born! Early on, let your baby lead. Let your baby will let you know what they want, but schedules and other programs aren’t important. Just surviving the first month is a challenge. Babies don’t need a lot of stuff, especially in the first couple of months of life. What they really need are parents who are devoted to them, who listen to their quiet coos and engage those furtive smiles. They need intense interactions with caring adults who will take the time to be there for them. I make a strong case, based on broad, excellent research that has been around for years, that babies need their mommies and their daddies to develop normally. Babies find mundane things interesting. Folding clothes, going to the grocery store and watering flowers may seem like chores to adults, but to kids, they’re not. Use mundane moments to teach your children. Mom and dads both play important roles in the lives of their children. Men and women are totally different creatures, but both add to the richness that a child needs for healthy growth. Parents will stand amazed at where their children will bring them and who they will introduce them to. There is reciprocity in having children. Continue to travel far and wide with your babies. SECRET: BABIES TRAVEL WELL…MUCH BETTER THAN PEOPLE EXPECT AND BETTER THAN WHEN THEY ARE OLDER. The larger family…and here I am talking about the extended family of grandparents, aunts, uncles and cousins…plays an important and valuable role in raising children. Don’t try to go it alone. Young parents need to schedule times to relax, reenergize and get away from their kids from time to time. I call these “parental Sabbaths”. People who do this WIN! Having kids is important from a DEMOGRAPHIC perspective. But people don’t generally have children for demographic purposes. Individually, young people have children because they want them! BUT, cultures that don’t value children and forget to have them, will face demographic challenges.